The carrot is a root vegetable that is a member of the parsley family. They are usually orange in color and long and slender, but heirloom varieties can range in color and shape, such as purple and round. They have been renowned for more than 2,000 year for their healthy properties and high beta carotene content - a precursor to Vitamin A. Carrots may be eaten raw or cooked and add sweetness and color to stews, soups, stir-fries, salads and more. They can also be boiled, grilled, braised, simmered, steamed, pureéd, roasted, sauteéd, etc. When purchasing them select ones with bright and moist greens; the carrots should be smooth and firm, not flexible. Store carrots in a plastic bag in the vegetable bin of the refrigerator. Avoid storing them near apples, which emit ethylene gas that can give carrots a bitter flavor. Carrots are one-third of the mire poix, a common French flavoring base of onions, celery and carrots. Carrots also pair well with allspice, almonds, anise, bacon, basil, bay leaf, butter, chicken, chile peppers, honey, and much more. While we usually associate carrots with the color orange, in fact, carrots grow in a host of other colors including white, yellow, red, or purple, the latter being the color of the original variety. The carrot is a plant with a thick, fleshy, deeply colored root, which grows underground, and feathery green leaves that emerge above ground. It is known scientifically as Daucus carota, a name that can be traced back to ancient Roman writings of the 3rd century. 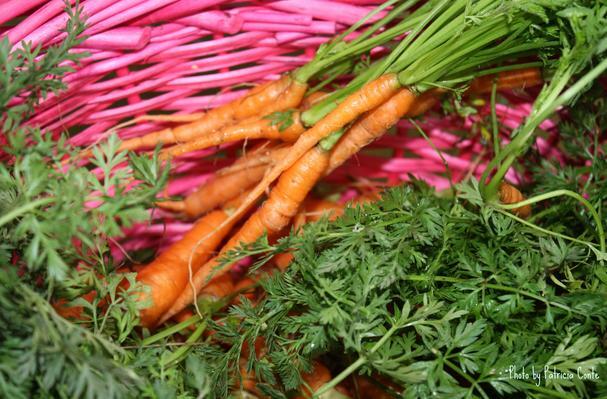 Choosing: Carrot roots should be firm, smooth, relatively straight and bright in color. The deeper the orange-color, the more beta-carotene is present in the carrot. Avoid carrots that are excessively cracked or forked as well as those that are limp or rubbery. In addition, if the carrots do not have their tops attached, look at the stem end and ensure that it is not darkly colored as this is also a sign of age. If the green tops are attached, they should be brightly colored, feathery and not wilted. Since the sugars are concentrated in the carrots' core, generally those with larger diameters will have a larger core and therefore be sweeter. Buying: You can buy carrots from you local grocery store or supermarket. Procuring: As your mother always told you, carrots are good for you - chock-full of fiber and vitamins. They're beautiful too, with lacy, fernlike foliage that's perfect for containers and flower borders. Carrots are cool-season veggies, but they perform best in temperatures between 60 and 75 degrees F.
Choose a site that gets full sun (carrots will tolerate light shade but won't do as well). Soil should be light, with a pH of 5.8 to 6.8 (see "How to Have Your Soil Tested"). Dig to a depth of at least 12 inches, and remove all traces of rocks and other debris - even a small twig could injure a carrot's growing tip, stunting the root or making it fork. Add plenty of organic matter; it will lighten heavy soils and increase the moisture retention of sandy ones. Carrots grow sweeter and less fibrous in soil that remains moist. Speed germination, which can take 10 days or more, by soaking seeds in water for 6 hours before you plant them. Make early sowings shallow to capture warmth from the sun; sprinkle the seeds on the soil surface, tamp them gently and cover them with a thin layer of finely sifted compost. If planting later, when the soil has warmed up, plant seeds between 1/4 and 1/2 inch deep. Thin seedlings before the tops become entwined: Either clip off the greens with scissors, or pull the roots very gently from the ground so you don't disturb the remaining plants. Allow 3 to 4 inches between carrots, depending on the variety (check the seed packet for details). Spray young plants once with compost tea (see "How to Make Compost Tea") to ensure good growth, and mulch with compost to deter weeds and retain moisture. Young plants need at least an inch of water a week, but cut back on watering as they near maturity (check the seed packet for timing). Begin harvesting carrots when they've turned deep orange. Carrots are delicious eaten raw or cooked. Beta-carotene is not destroyed by cooking; in fact, cooking breaks down the fiber, making this nutrient and carrots' sugars more available, thus also making them taste sweeter. Take care not to overcook carrots, however, to ensure that they retain their maximum flavor and nutritional content. If they are not organically grown, peel them; most all conventionally grown carrots are grown using pesticides and other chemicals. If the stem end is green, it should be cut away as it will be bitter. Cleaning: Wash carrot roots and gently scrub them with a vegetable brush right before eating. Unless the carrots are old, thick or not grown organically, it is not necessary to peel them. It seems that carrots did not become a popular vegetable in Europe until the Renaissance. This was probably related to the fact that the early varieties had a tough and fibrous texture. Centuries later, beginning in the 17th century, agriculturists in Europe started cultivating different varieties of carrots, developing an orange-colored carrot that had a more pleasing texture than its predecessor. Europeans favored the growing of this one over the purple variety, which was and still is widely grown in other areas of the world, including southern Asia and North Africa. Carrots were subsequently introduced into the North American colonies. Owing to its heightened popularity, in the early 1800s, the carrot became the first vegetable to be canned. Today, the United States, France, England, Poland, China and Japan are among the largest producers of carrots. History: The carrot can trace its ancestry back thousands of years, originally having been cultivated in central Asian and Middle Eastern countries. These original carrots looked different from those that we are accustomed to today, featuring deep purple coloring, ranging from lavender to deep eggplant. This coloration was a reflection of the anthocyanin phytonutrient pigments these carrots had. In pre-Hellenic times, a yellow-rooted carrot variety appeared in Afghanistan and was further cultivated and developed into an earlier version of the carrot we known today. Both types of carrots spread throughout the Mediterranean region and were adopted by the ancient Greeks and Romans for their medicinal use.